Joseph Westrick became Gannon University’s first-ever NCAA cross country qualifier by finishing fifth at the Atlantic Region Championships, held Saturday at the Bob O’Connor Golf Course in Pittsburgh’s Schenley Park. Westrick finished fifth overall with a time of 34 minutes, 43 seconds in the 10K event, to propel the Knights to an eighth-place team finish – the best team finish since the school moved to the Pennsylvania State Athletic Conference prior to the 2008 season. On the women’s side, Gannon’s Grace McGrath became the Knights’ first all-region female runner since 2015 as she finished 14th overall in the 6K event with a time of 25:07. McGrath’s performance led Gannon to a ninth-place finish – the best regional finish for a Gannon women’s team since joining the PSAC. McGrath came within eight runners of qualifying for Saturday’s national championships. 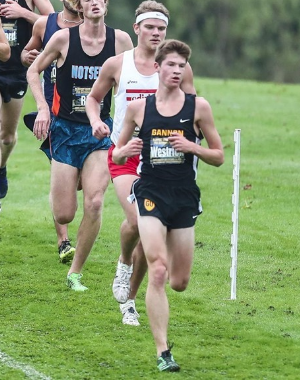 Westrick, who became Gannon’s first two-time all-region runner after finishing 19th last year, will return to the Schenley Park course for the third time this season when he competes in Saturday’s Division II national meet. Westrick earned a bid to the national meet by finishing among the top five runners who were not part of a qualifying team. He finished nine seconds behind fourth-place finisher Ryan Clifford of Mansfield. Jason Weitzel of Concord won the race in 34:01. Charleston University took team honors with 62 points, followed by two PSAC schools – Shippensburg and Edinboro. Other Gannon finishers were Ryan Garich (27th, 36:24), Eric Ingram (41st, 37:05), Garrett Sutton (85th, 39:04), Kyle Martin (94th, 39:35), Brett Whitty (103rd, 40:32) and Mitchel Daubert (109th, 41:35). Garich improved his finish by 62 spots from last year’s regional and wound up two places from an all-region finish. Edinboro captured the women’s team title, finishing ahead of fellow PSAC entrants California (Pa.), Shippensburg, Seton Hill and Kutztown. Alicia Belko of California (Pa.) won the event with a time of 23:25. In addition to McGrath, other Gannon finishers were Alena Wisniewski (49th, 26:41), Meredith Morse (54th, 26:47), Sarah Fiorello (55th, 26:47), Tori Panian (84th, 27:47), Taylor Roberts (92nd, 28:00) and Ashlynn Uzl (110th, 28:50).